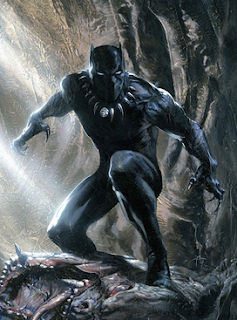 Unless you are living under a large vibranium rock, you probably heard something about Black Panther this past weekend. In our current environment there are only two types of movies for which Americans will purchase a ticket: Star Wars affiliates and the next installment from the bevy of superheros in the Marvel Universe. After years of hype that reached a fever pitch, out came Black Panther and it lived up to the hype and then some. Earning rave reviews and setting box office records around the world. But, this film is more than that and I did not sit down here to write a movie review. Black Panther is a reorienting experience. It flips the world in a way that has the power to positively impact an entire generation for years to come. "No, I get to wear the costume!" "You wear the claws, I get the mask!" At this point I assume their mother interceded and after rock-paper-scissors, the chief tool of pre-adolescent diplomacy, the outfits were decided. Then, the feature began. And it was marvelous. I loved every moment of it. But, I can guarantee you, my joy was not the greatest in that room. I know it wasn't even the greatest in our row. Because I can only imagine what those two young men next to me experienced over those two hours. For them whether they know it or not, this would be a day brimming with potential to rearrange their lives. They walked into a theater and they saw a screen full of people who looked like them. And the people on that screen weren't being arrested, oppressed, victimized, or stereotyped. The people on that screen were in control of their own destiny and that of the world around them. They were powerful and were choosing to leverage that sovereign power for good. They were choosing compassion and righteousness. Here it was, America's crowning media genre and at the center of it, people like them were being cast in an unquestionably good light. They were scientists with technology developed far beyond the world around them. They were empowered without any need for outsiders, but choosing to use their advanced medicine to heal an outsider because it was right. They were leaders who were unsullied and unburdened by any stain of history or prejudice. I thought about those boys and all of this as we made our way back out to the car and then I thought of the five year old boy with black skin in our home and the promise and hope that this story would hold for him and his future. Because representation matters. The way we see ourselves portrayed in media and by society at-large does not have a causal effect on our future, but it does have an imaginative impact. When I grow up in a society that portrays me as college-bound, powerful, wealthy, and important, it does not guarantee I will be any of those things, but it makes it a whole lot easier. If I grow up in a society that portrays me as defective, marginalized, and lesser, it doesn't make one any of those things, but it does re-write the narrative of the human heart. And the internalized voice within us is tough to shake (especially when the full weight of that society is pressing in on you day after day seeking to impress that wicked lie on you deeper). So, when the Black Panther does a simple act like sit on his throne, when Shuri walks in bearing a new device that she has ingeniously engineered, or when Nakia stands up for justice in the face of opposition, what we see isn't merely another plot point, it's a world flipping on its axis. In those moments, I can see the hearts of children forming a new view of the world and a new view of themselves. I can see a picture of the future that shouts dignity, beauty, and even love. And that's more than just another big budget diversion. "Now, can I open it?" "I open my gift now?" Conversations like this have become a regular institution in my household since my wife and I became foster parents to an amazing five year old several months ago. The new experience has taught me a lot. And maybe now, with interactions like the above those lessons are being tailored for Christmas. Just as my kid doesn't like waiting to open his presents, I don't like the waiting inherent to the Christmas story as well. But Christmas, at the deepest level, is about expectant waiting. There's the relational arc: Waiting to see friends and family after long separation. There's the consumerist arc: Waiting for deals and Amazon boxes. There's the fictional arc: Waiting for a jolly man to commit some reverse B&E to your home. But, there's also a divine arc of waiting. The first half of the Christmas story is about waiting for an arrival. It starts millennia before a manger in Bethlehem when a promise was set forth in Genesis 3 that a Rescuer would one day undo the work of the serpent and heal the enmity between man and God and all creation. Clues about the identity and work of this Rescuer were given throughout the centuries and God's people waiting for this Person to come. For generation after generation after generation, people lived and died looking forward and believing that God would one day send Someone who would undo all that was evil and broken in the world. Finally, this culminated in the arrival of Jesus in an inconspicuous city. He was born to a young girl, fled as a refugee, and raised in a backwater area no one believed to be of any consequence. But this was it, the end of the waiting. The Rescuer had come and he indeed did work rescue. The second half of the Christmas story, where we find ourselves today, is about waiting for a return. From the point of Jesus' ascension onward, His followers have been waiting for this Rescuer to arrive once again. He promised that though he was leaving that one day he would appear and set all things right. That he would wipe every tear away from our eyes and make an end to all war and death and oppression. He promised that we would see him face to face and be in his presence. His return is to bring with it fulfillment of every good thing, an answer to our every cry of pain, despair, and hurt. Christmas is about remembering the waiting of others and engaging in waiting of our own, waiting for this God to come and live with us. I don't know about you, but 2017 was hard for me. The dignity of my community and worth of my neighbors was assaulted from the most powerful officials in our nation. On a weekly basis, I held a crying child in the middle of the night to assure him it would be alright (not knowing if I could ever truly protect him from those fears). I saw lives torn apart again and again and again by sin, systems, and choices. I saw friends reach incredible triumphs only to have their whole foundation crumble under their feet. And I had to digest all that into my own psyche and ask, "What is there to hope in?" So, this Christmas, what are we waiting for? The great hymn "O Holy Night" gives us one glimpse. In the third verse the song proclaims, thinking of the coming of this great Rescuer, "And in his name all oppression shall cease." This Christmas, our waiting can be embedded into this lyric. Whatever it is that you are waiting for, the Coming King stands ready to answer. We put our hope and our waiting in him, even if we don't know when it is that he will answer. We can sing, "And in his name all depression shall cease." We can sing, "And in his name all chronic pain shall cease." We can sing, "And in his name all defamation of the Image of God shall cease." We can sing, "And in his name all sin and consequence shall cease." At Christmas, we wait. At Christmas, I invite you to fill in the blank. We remind ourselves that millions of our brothers and sisters sat in expectancy for lifetimes and one day saw the fulfillment of the coming Rescuer, so we too can have the strength to put our hope in him. For we know that he has come, we know that he lives still, and we know that he is with us in our waiting. His second arrival is promised and while we wait we can call upon his name. Two years ago, I first heard a reference to the Brooklyn neighborhood of Jacksonville where a series of restaurants, apartments, and an upscale grocery store were being built. Unfamiliar, I joked about it at the time, "Is that a real place or just some developer's ploy to attract white people who wish they lived in New York?" 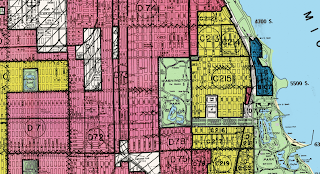 It wasn't until recently that I learned that the neighborhood wasn't named as a marketing gimmick, but was actually a historically-black neighborhood that in 1950 numbered 5,000 residents, but had shrunk to 60 by 2010. And its depopulation was no accident. In my own neighborhood there's a series of streets that are tucked away and almost invisible unless you are looking for them. These streets are poorly lit, abandoned by city maintenance, and all dead-end after a block or two when they run into overgrown chain-link fences that back up to I-95. That, too, is no accident. 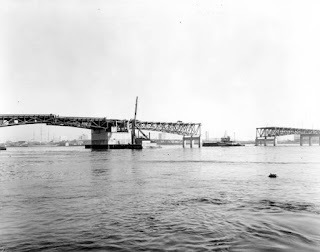 In Jacksonville, and many other cities all across the country, the development of the interstate highway system wasn't taken on merely as a public works project, but also as "blight removal". And oftentimes, the charted course was designed to wind and weave roads through predominantly black neighborhoods, scattering the populace and cutting communities into pieces. In 1954, the Fuller Warren Bridge was opened, which connects I-95 across the banks of the St John's River. The location of the bridge sent a message. The north bank construction traced directly through the Brooklyn neighborhood, not only displacing a significant portion of the population, but also providing an eight lane barrier to separate what remained of Brooklyn from wealthy, white Riverside to the west. The past is the past. I wasn't on City Council. I didn't work for the DOT. It's not my problem. It matters because folks who were raised and look like me have the ability to whitewash history. Folks like me can make jokes about where the name Brooklyn came from without having to know the real history or the real people who lived there. It matters because history is an ongoing force of cause and effect. It matters because history has explanatory power, but if we don't know history, we rely on false narratives. This is the famous Norman Rockwell painting "The Problem We All Live With" depicting Ruby Bridges, the young girl who desegregated New Orleans' public school system. This painting and the story it tells feel old to me. It feels distant. It is from another era altogether. 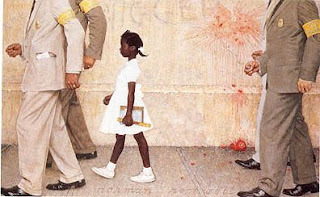 But, today Ruby Bridges is only 62 years old. My parents are older than her. She was only 31 when I was born! To her, I promise you, it doesn't feel like a vignette out of a history book. This is not history as an abstract concept. This isn't ancient legends told around a campfire or tales recounted in a college lecture hall. Many of the "histories" that are happening all around us are much more recent than we would like to admit. And many of them are invisible to us if we don't go out of our way to learn them. Further, these historical impacts and deficits are passed down to each generation. Their effects carry on to the present. In the 1940s, the federal government participated in two blatantly racist housing programs. First, the Federal Housing Authority created a system called "red-lining" and successfully pitched it to the mortgage industry. 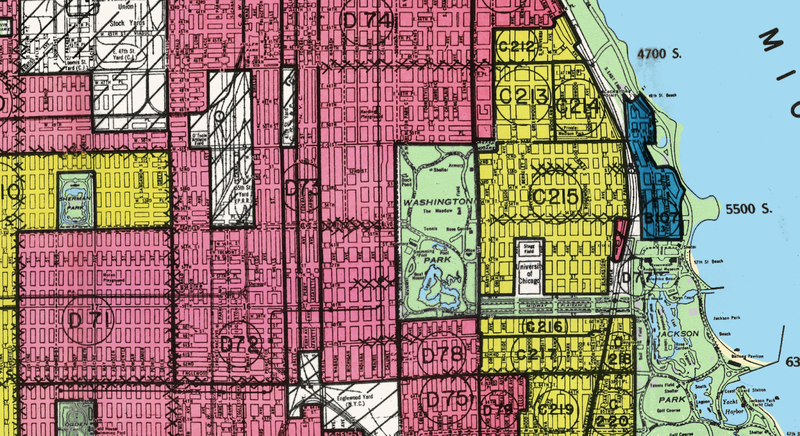 Under this concept, literal red lines were drawn around black neighborhood on maps and companies would refuse to approve mortgages within them. As a result or this policy and ongoing forces of housing segregation, home ownership became basically impossible for most African Americans. Later, the GI Bill was passed for soldiers returning from World War II and gave disparate benefits to black and white soldiers. Many of these benefits were related to the ability to purchase homes or land. Over time, this meant hundreds of thousands of white soldiers were able to purchase property from which black soldiers were excluded. Those laws and policies have long since been repealed, changed, and disavowed, but their impact remains. Today, the average white family has 16 times more wealth than the average black family, and the most substantial way wealth is passed down a family line is property ownership. So, while these policies are no longer the law of the land, their consequence is and has been etched into our modern reality. Finally, the ability to avoid this history is not only a prime example of white privilege, but will lead us down false paths. If I do not know history, including how that history impacts the present, I will come up with alternate (and false) explanations for the reality around me. History helps explain how Brentwood, my neighborhood, became the hood. It's a story influenced by Jim Crow and highways and medical incinerators built next door and government policies and economic suppression and educational disinterest on the part of the city, but if my knowledge is divorced from all that history, I might just assume there is something faulty about "those people". And recent opinion polls will tell us, this is the explanation favored by many Americans. Racism and prejudice thrive when we don't know history. Ignorance reigns victorious when we don't know history. Empathy is hindered when we don't know history. And true unity and justice (more on this next time) are impossible if we don't acknowledge and learn from history. So, if we are to be a people who are about the truth, it is essential that we be a people who know our history. I write to you with a demand that we, the American populace, celebrate our shared and valued history, our unique national story of origin, and the men, flawed though they may have been, who made this country great. My proposal is simple. With the burgeoning population growth, our district would be well served to commission the construction of a new high school. It is my humble suggestion is that this school be designated Benedict Arnold Senior High School: Home of the Redcoats. Just imagine the benefit to our student population as they gather at this new institution, cheering on their red-clad compatriots on the field, gaining a new appreciation for Revolutionary history in front of the Arnold statue guarding the entrance, and mastering the lesson that all loyalty is relative. Now, of course, let me address the elephant in the room. Yes, Benedict Arnold was a complicated figure. Some say he was a "traitor" who sought to destroy the young United States. Some say he was a dastardly double-crosser and not the type of man we should honor by naming a school after him. But, these voices are, in truth, dangerous. 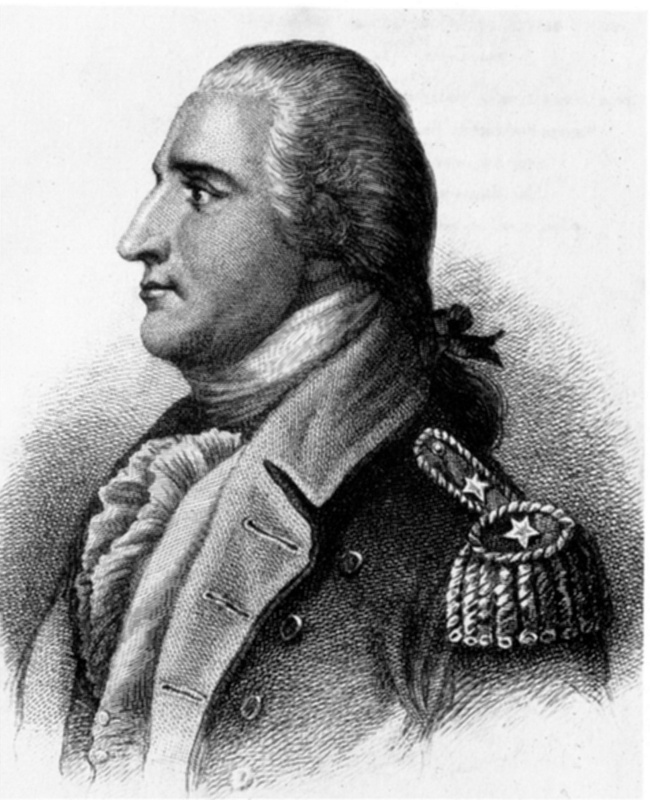 Benedict Arnold, nay, Brigadier General Arnold as I shall henceforth recall him, is an important figure in the history of this great nation. We would not be the country that we are without him. How dare we would consider sanitizing history by not honoring a figure like the General! How dare we deny a figure so integral to America! Those who would seek to silence, to forget, to gloss over General Arnold, they are the problematic ones! They are the real traitors! So, yes, we can encounter some of the ambiguous aspects of this man, but let us consider his deeper motives. Let us consider that being British is how he was bred. We cannot expect him to suddenly turn his back on his own! Let us consider that he was a devoted family man who fathered eight children! Let us consider that he was a product of his time! "Tradition, not treason" as I like to say! I know some may get caught up that General Arnold sought to kill American soldiers, that he sought to do so on behalf of an enemy army, and that he tried to hand over West Point to the British, but look at all there is to value in such a man, namely: loyalty, patriotism, and protection of a way of life. We need to teach our students about loyalty. We can do this by acknowledging General Arnold's missteps, but we can also do so through an examination of his life in context. He served in not one, but two armies! What valor! What loyalty! The General's loyalty can be seen that he did not merely trade sides to the Redcoats at no cost, but rather negotiated a payment AND an annual pension in exchange for his services. This man was bought, but not easily. He was a man of loyalty. We need to teach our students about patriotism. General Arnold fought for the nation that he believed in and though, yes, that nation was not the United States, and while yes, they were defeated, is it not ultimately more patriotic to fight on behalf of a losing cause that one believes in. Just think of our fellow honorees Generals Robert E. Lee and Stonewall Jackson, who we have named many schools after! (Not that we could ever draw a parallel between these situations. That would be absurd). Brigadier General Arnold fought for his nation(s)! A patriot without equal! We need to teach out students about protecting their way of life. Protecting our traditions (tradition, not treason, right?). More than 40 million Americans identify as having British ancestry. How can we not celebrate their cultural lineage? Do we not speak their language? Do we not eat their delicious cuisine like fish and chips and . . . baked goods. General Benedict Arnold, though born in Connecticut, knew nothing of a United States of America as you and I do, what he did know was Great Britain and how dare we penalize him for simply protecting his own way of life! How dare we withhold memorializing him because he dared to preserve his culture! Yes indeed, we all make mistakes and all have parts of our past we might not want highlighted, but in the midst of it all, let us not forget our heroes. Let us not forget our turncoats either. So join me, will you not? Three cheers for Benedict Arnold Senior High opening soon on Jefferson Davis Memorial Parkway! Hip hip . . . .
An old friend of mine works for a radio show that covers the intersection of Christian faith and culture. She recently invited me to share some thoughts about Kendrick Lamar and I was happy to oblige. You can read the piece here and hopefully I'll have some new content in this space coming out soon. When is the last time you played a board game or computer game? Swam? Danced? Traveled by car? I ask because I'm thinking of your safety. You see, the odds of dying while playing a board game or computer game are 1 in 100,000,000. The odds of dying while swimming are 1 in 1,000,000. The odds of dying while dancing are 1 in 100,000 and the odds of dying when behind the wheel are 1 out of every 6,200 licensed drivers. Yet, there is a major conversation going on in our country based on the safety risk posed by refugees. The theory goes: Islamic extremists will sneak into the USA as refugees and then commit terrorist acts. But, let's hold this claim up to scrutiny for a moment. What are the odds of being killed by a refugee terrorist? You are literally 36 times for likely to die while playing Scrabble than at the hands of a refugee. You are 36,000 times more likely to die doing the chicken dance at Cousin Carol's wedding. You are 580,645 times more likely to die driving to see Hidden Figures at the multiplex this weekend. My point here is not that you shouldn't drive or dance or swim, because believe me, everybody would benefit from going out to see Hidden Figures tonight. My point is that we risk our safety all the time. Risks that are statistically far greater than those found within the existing American refugee system. And what do we take those risks for? Often for nothing more than our own convenience, efficiency, or comfort. Driving a car is not a requirement of livelihood, but we do it because we weigh the risk and we value getting to the grocery store faster rather than the alternatives. Yet here, we stand with literally tens of thousands of people, most of them women and children, dying, but our "safety" is apparently more important than their lives. But, Scrabble, that's worth the risk. If you consider yourself a follower of Christ, this next section is for you. We serve a God who is jealous. This is not to say He is jealous like a six year old at his friend's birthday party looking at a pile of gifts, but that he is jealous like a husband watching his wife sleep with another man. He's not shy about using that exact illustration. Anytime the people of God chose to elevate some other value over His values, He calls it idolatry. When we do that, we are worshiping something else and something false. And while I think the theological implications and directives of how Christians should treat refugees (along with all marginalized groups) are quite clear , I would rather drill down a little deeper into one particular idol I see rampant in the American church: Safety. Christian radio bills itself as "safe for the whole family", 81% of white evangelicals voted for a presidential candidate who promised to "Keep America Safe Again", and I personally have had Christian leaders tell me they carry guns when they come to my neighborhood for protection. The problem of this all, of course, is that safety isn't a Christian value. In fact, Christian values have led me to do a whole slew of things in my life that aren't considered "safe". I have friends who have been shot for Christian values. I have friends who have sold all their possessions and moved overseas for Christian values (even to Muslim nations). I have friends who are citizens of other nations that daily risk their safety just by identifying as Christians. So where do we, the American Church, get off claiming any right to safety? This idol of safety plays out in a myriad ways. Here's just one that I've seen repeatedly. 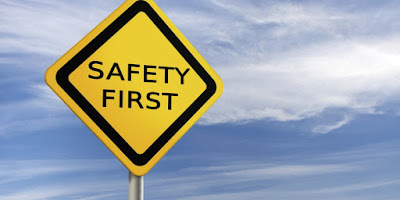 The single greatest deterrent to college students coming and interning at our ministry hasn't been cost or travel or schedules, it has been middle and upper-middle class Christian parents, who declare it too unsafe for their kid to spend the summer in the hood. This is the same idol that causes us to declare refugees to be unsafe (even though the existing vetting process is intense and no one who wanted to cause harm to America would ever choose the refugee route when far easier options exist). It's the same idol that lead us in the past to deny the Imago Dei of Jewish refugees and turn them away. It's the same idol that is behind so much rhetoric about undocumented immigrants. 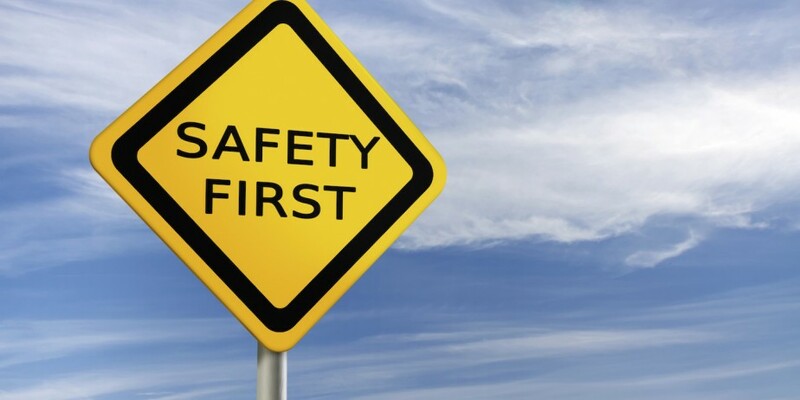 When we elevate safety as a Christian necessity, we turn our back on our God. Tim Keller has said that there's not a problem with fundamentalism. It all depends on what your fundamentals are. And if one of your fundamentals is a man dying on a cross for his enemies, that ought to drastically impact the way you see and live your life. Jesus Christ wasn't concerned about safety for Himself or His Church. He's a Husband desperate that His Bride would turn away from her idols and come running back to His forgiving arms. 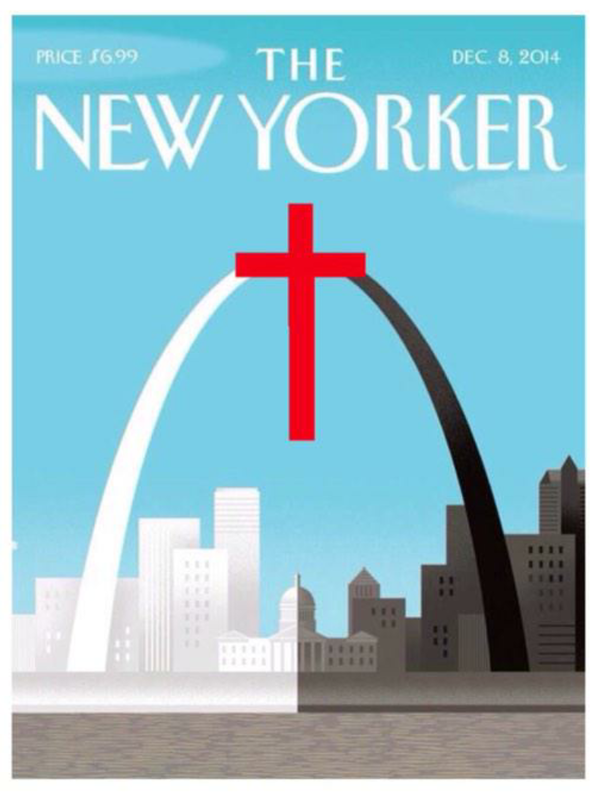 Above is the cover from the upcoming issue of the New Yorker. It is poignant. It is well crafted. It is all too true. 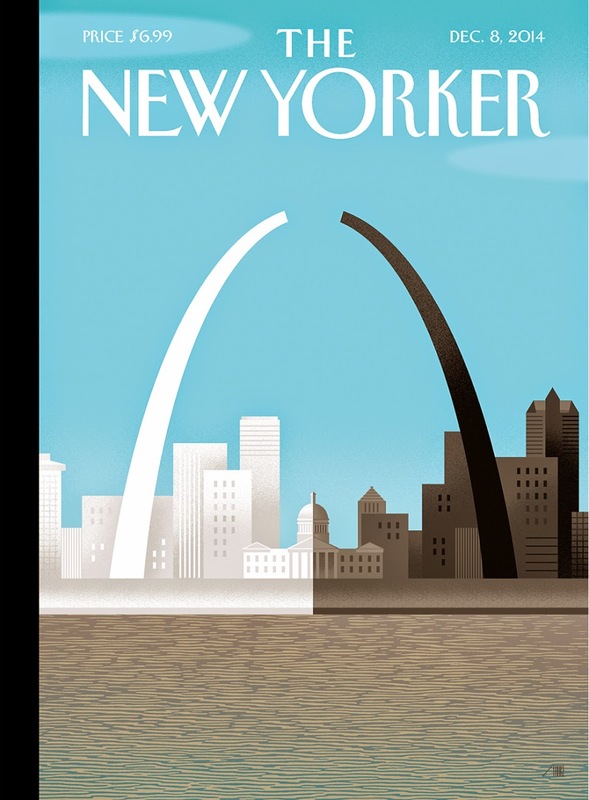 Not just of St. Louis and our current challenges, but true all across the nation. When I first saw it posted on Twitter, I enlarge the picture and stared at it for a few seconds (which in Twitter-time is the equivalent to hours). I appreciated it and I was saddened by its accuracy. Below is a revised version of the picture I saw the next day. I reacted similarly to it. When viewing this image, there are a couple of possible reactions. One is the view the picture and want to dismiss it as trite and overly simplistic. I think this is false. The cross of Jesus Christ isn’t a mere symbol of religious devotion or Polyanna, kum-ba-yah optimism. The cross is an instrument of death. It is a tool of capital punishment. It is an artifact of the actual, historical killing of Jesus of Nazareth. The Cross isn’t weak or trite, it is costly. Specifically the cost of death and shed blood. The Cross, in its brutality, in its savagery, in its torturous death-bearing, is about much more than convenient “solutions” and upbeat worship songs. It’s about much more than man being brought close to God (though this is essential!). It’s even about much more than the fact that, as Tim Keller puts it, I’m far worse than I’d ever imagined and far more loved than I ever dared hoped. The Cross is about the tearing down of walls. The tearing down of the wall of separation between man and God. The tearing down of the wall of our guilty status before a righteous God. The tearing down of the wall of hurt and pain and brokenness from our past. And the tearing down of the walls between ethnic and racial groups. Without launching into a full exegesis that would fill dozens (hundreds?) of pages, I can say this, the Cross is about healing ethic and racial divides. Is that all it is about? No. But that is exactly and primarily what the above text is talking about. Two groups of people. Separated ethnically, culturally, religiously, and socially being brought together under the headship of and by the blood of Jesus Christ to become one, unified people. A humanity that strives together. That mourns together. That prays together. That worships together. That considers the other better than oneself. That sacrifices for one another. That listens to one another. The Cross is the answer. The costly Cross where Jesus died so that the dividing wall of hostility would be torn down. And you should do ALL of those things. All of them. Seriously, go do them! But, as you do them, don’t believe that will “fix” it. In Divided By Faith, a book I have discussed extensively here, the authors refer to a belief many Christians cite that the authors call “the miracle motif”, which simply is that if everyone became a Christian, all racial and ethnic problems would cease. Once again, to limit this to paragraphs rather than dozens (hundreds?) of pages, I will only touch on the main points here, but personal relationships and church fellowships won’t erase the problem. The problem didn’t develop overnight, nor will it be healed overnight. There are hundreds of years of history to reckon with first. There is the reality of systemic injustice to be wrestled with and ultimately deconstructed. There is the fact that the relationships and friendships I recommended above are really, really hard. The solution isn’t just around the corner, but it is present with us. Jesus Christ cares about injustice. Jesus Christ cares about tension. Jesus Christ cares about division. And He died to heal it.